One of the great aspects of teaching a subject that is close to your heart is the seeing students develop and creating their own milestones. Lets have a look at a couple of student journeys. Mike attended my eight week evening course during the winter 2016. He keeps bees with his buddy Dave. They got there bees in the spring of 2016. He bought his initial nucs (starter colonies) from me but soon decided to get some additional bees from a different genetic pool. Between them, Mike and Dave, built up the colonies through the summer and the weathered the long winter of 2017/18. 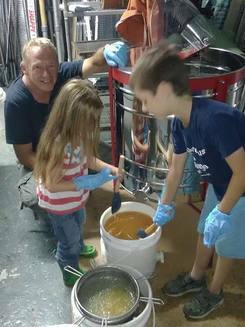 As you see from the picture Mike is not slow to enlist help from his grandchildren. Mike's daughter who was at first reticent about beekeeping now her own beesuit and has taken control of one of the colonies. Mike, being chap to embrace a project, invested in an electric extractor. Given this years crop it looks like a wise decision. "Hurrah two buckets of honey. 18 months ago I was dreaming of keeping bees and since Dave's course we have results. Thanks for the confidence Dave the beekeeper"
Lisa's story is different. Lisa training took place on a weekend course in the long winter of 2018. Lisa also bought an over wintered nuc from me. They are so mellow she often does not bother with a beesuit. 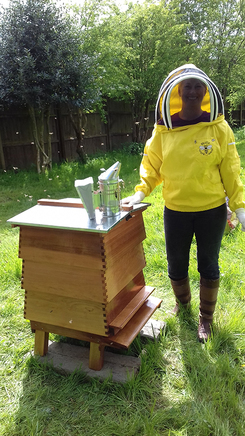 The long winter prevented us getting the nuc into Lisa's beautifully presented WBC hive. The congestion that occurred triggered the nuc to prepare to swarm. Lisa quickly procured a second hive and did an artificial swarm (split). We did the split and following a false dawn the new queen emerged to take over the colony. Just for fun the new queen squeezed through the queen excluder and started laying in the supers. When the new queen matured and got a little chunkier we were able to put the queen under the excluder where she has been happily going about her business. The early summer has been extrordinary. Not only have the colonies built up quickly they have pulled in enormous amounts of honey. Lisa has already had a crop and getting ready for the second ! Lisa really has been on a fast track in beekeeping. "What an amazing but mind boggling weekend I’ve had with David learning about keeping bees. Anyone thinking about joining one of his courses, do it!!" Michael was on the first course too. He too had an up and down first season. The second season, once the winter decided to stop, has been a bit more straight forward. Mike's approach to the honey crop is a bit different. Mike takes out a single frame of honey, one a week or so. He filters the honey through a very fine mesh. It takes ages but the honey could not be more pure. Mike is experiemental in his beekeeping. In this picture Mike has put in a blank frame and you can see how the bees have started drawing it out. In due course the bees will fill out the frame and Mike wont need to extract the honey. He can eat the comb and honey in one go. As members of the group we have regular meetings at the local YHA National Forest to talk bees. Mike says "Another great and insightful night, was good to catch up with all that turned up!" 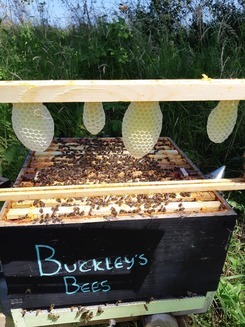 If you fancy learning beekeeping click HERE and find when the next course is to be run. Join the growing band of Bee Farmer trained beekeepers.